Crocheting is a relaxing and creative hobby enjoyed by many. You can use large crochet hooks and small, make afghans, prayer shawls, scarves, and delicate doilies...the creative possibilities are endless. 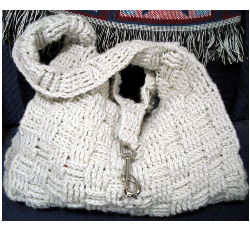 I returned to crocheting after years of doing other things and have made things as simple and quick as bookmarks, hats and fingerless gloves, to more complicated things like sweaters, prayer shawls, afghans, and the basketweave purse pictured here. I made the one pictured and another in brown flecked yarn. At first I needed so much help because so many stitches and stitch abbreviations had been forgotten. Then I started searching the internet for crochet patterns, and how to do the crochet stitches I had forgotten. Below is a collection of links to stitch tutorials and abbreviation interpretations that I discovered and compiled in one place, for your reference as well as mine.